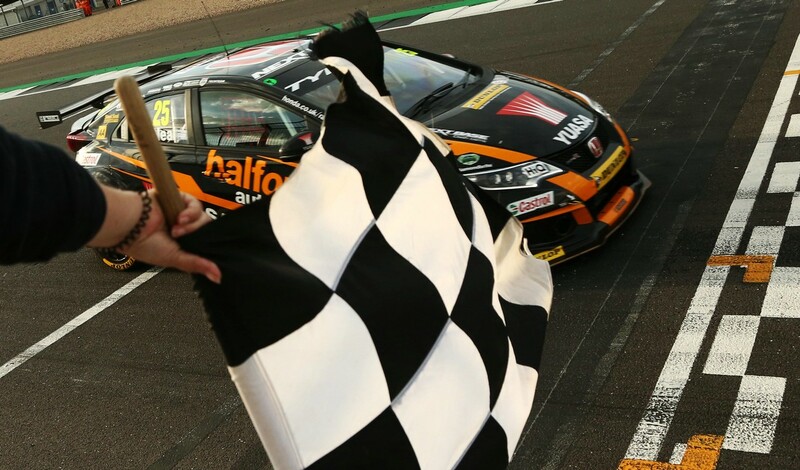 Matt Neal produced arguably the drive of the weekend in the Dunlop MSA British Touring Car Championship at Silverstone today (17 September), as the three-time title-holder stormed through the pack from 12th on the grid to tally his 61st career triumph. At the celebrated ‘Home of British Motor Racing’, Neal qualified his Honda Civic Type R fourth. Despite carrying 57kg of success ballast, Halfords Yuasa Racing team-mate Gordon Shedden was just 0.165s behind, but so close was the field – with all 32 cars blanketed by less than a second – that the deficit equated to eight positions, leaving the Scot a disappointed 12th in the pecking order. In the curtain-raiser, Neal initially emerged at the head of a multi-car scrap over fourth until contact with Mat Jackson saw him slip outside of the top ten. He would go on to cross the finish line 13th, two places behind Shedden, with the pair’s efforts earning Honda the Manufacturers’ award. In race two, Shedden went on the attack as the defending champion posted the fastest lap on his way to seventh position, but Neal struggled for pace on the harder-compound tyres and had to recover from a wild slide at Brooklands on the opening lap that dropped him to 20th, with a seven-place gain yielding 13th when the chequered flag fell. In the finale, there would be no stopping the Midlander, as he proved the potential of the Civic Type R by picking off his rivals one-by-one. By lap 16, he was up into second and after shadowing Rob Huff for five laps, his sustained pressure paid off as the race leader ran slightly wide on the exit of Copse and Neal seized his chance to pounce for his second victory of 2017. There was less joy, sadly, for Shedden, who found himself unceremoniously removed from contention by Rob Austin while in the mix for a podium finish, but the Scot will nonetheless travel to Brands Hatch for the season finale in a fortnight’s time (30 September / 1 October) still in with an outside chance of retaining his hard-fought Drivers’ crown.